Who typically sells their house to Nickel City Buyers, LLC? That’s a great question. People sell their houses to us for a variety of reasons. They may need to sell inherited property quickly. They simply want to unload rental property with difficult renters. They may be relocating to another area and don’t want to have the headache of the typical drawn-out selling process. They may be going through a divorce and need to get as many liquid assets as possible. They may be behind on mortgage payments. They may be facing foreclosure. They may want to avoid wasting time or money making necessary repairs. One thing that all of these people have in common is that they want to sell their house fast to a local, family-owned, honest company. They want a quick, hassle-free sale of their house that will allow them to move to their next phase of their life quickly. Nickel City Buyers, LLC is a Real Estate investment and solution company. We are property acquisition specialists that buy houses to renovate. We never ask for fees or commissions when we want to buy your property! However if listing your property is the best solution then we can and will connect you with a Highly recommended licensed agent in your area. How does your house buying process usually work? First, you give us some brief information about your house by completing the Sell Your Form above or calling 716-261-CASH(2274) 24 Hours. One of us will contact you to arrange a visit to your house. You’ll have a chance to ask whatever additional questions are on your mind. We’ll make our Best Cash Offer based on the market value of your house. We will make an offer within 72 hours if it’s meets our guidelines. And you can be sure that we always give our Best Offer. What is your Best Offer Guarantee? We don’t like to play games, or make you feel like you’re in a price negotiation. That’s why we promise to give you our very best offer the first time. We’ll just tell you how much cash we can give you. And you decide if it’s right for you. There’s no obligation and no risk. Am I obligated in any way if I send you my information for a cash offer? No. Nope. No way. 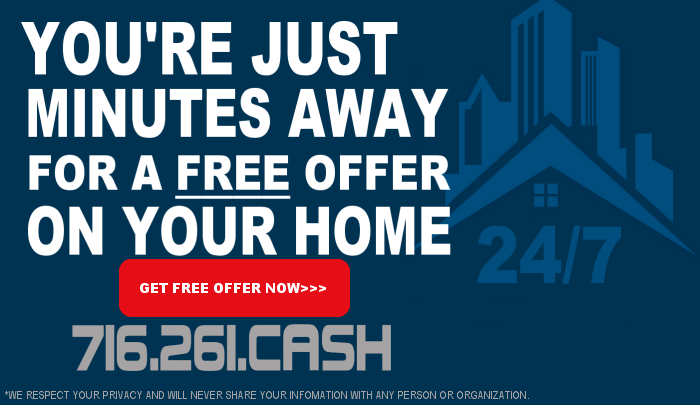 This cash offer is completely risk-free, and is offered at no-obligation to you. We are so confident that we can offer you more than national franchises, that we’re more than happy to tell you how much we’ll pay. Will I have to pay any fees for you to buy my house? You won’t have to pay a dime. Ever. Your privacy is of the utmost importance to us. Any information you provide is completely confidential! We are a reliable, reputable company who will treat you with professionalism, understanding, and respect. If you still have questions! Contact us 24/7 with your questions and we’ll be happy to respond ASAP!